Lifetime show “Love at First Flight” is now casting for 2018 / 2019. The next season of the show is looking for singles who absolutely love to travel. The show is on a nationwide hunt for singles 18+ who are ready to travel. Initial casting is being done online via video auditions and singles chosen to possibly appear on the show will be invited to a final in person casting in the second part of May. The final rounds of casting will be done in Los Angeles and those chosen will have their travel expenses paid for by the production. Singles cast for the show, will then need to be available for around a month and the show will be paying for the trips to the filming locations. 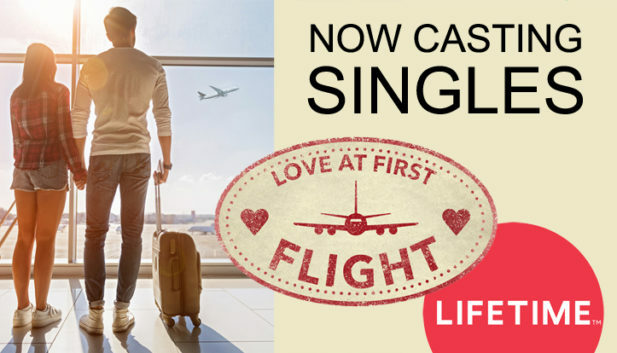 The brand new season of Lifetime’s exciting new dating show, “Love at First Flight” is now casting singles to find love in the most fun and thrilling way possible – IN THE AIR! They say if you travel with someone and fall in love by the time you return home, you should marry them on the spot. Well, we’re going to put that to the test! Travel under normal circumstances can be a very stressful time in life. But imagine that at the very end of your journey, you could be getting married. “Love at First Flight” takes travel to the next level, brand new couples are matched up on a romantic journey across North America beginning in New York. They go across the country to Los Angeles, but their compatibility is tested by very unpredictable pressures and uniquely crafted challenges. At their end destination in Los Angeles, the couples have the chance to get married as soon as their final flight ends. Our expert matchmaker will pair you with your ideal match and fly you both in style to fun-filled destinations and romantic adventures like you’ve never imagined. Once you return home, you decide what happens next! Is this the end of your journey, or will there be wedding bells? Interested? See the following page for all the details.